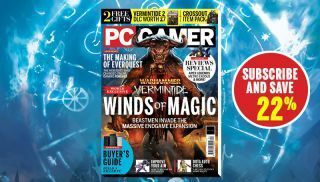 Subscribe to PC Gamer magazine for 3 months for just £15 Get our magazine sent to your door for 22% off. Magazine Also: Our Top 100 mag, Cyberpunk 2077, Beyond Good & Evil 2, our laptop group test and more! Magazine Also: PUBG, Cultist Simulator, Iconoclasts, our processor group test and more! Magazine 48 pages of indie games, our 2018 preview, the history of Ion Storm part two and much more! Magazine Also: Destiny 2, Wolfenstein 2, our 4K monitors group test, and loads more! Magazine Also: Final Fantasy 15, the history of the FPS part two, our CPU cooler group test and loads more.